U.S. stocks retreated for a third day last Thursday, ending a holiday-shortened trading week lower as geopolitical risks escalated for a second straight week. Following last week’s U.S. cruise missile strike against a Syrian air base, losses accelerated into the week, culminating on news that the U.S. military dropped its largest non-nuclear bomb on an ISIS target in Afghanistan. Investors were also stunned by President Trump’s reversal on a campaign position, saying he would not label China as a currency manipulator. He also added that he prefers a weaker U.S. dollar and hinted he is open to keeping Janet Yellen in her role heading the Federal Reserve. For the week, the S&P 500 fell -1.11%, the Dow Industrials declined -0.98%, and the MSCI EAFE (developed international) lost -0.09%. As mentioned, the headline Consumer Price Index (CPI) fell by 0.3% in March, pushed down by an outsized 6.2% drop in gasoline prices, which more than outweighed an ongoing rebound in food prices. However, the unexpected 0.1% decline in “core” consumer prices (which excludes volatile food and energy prices) was the first decline in that index in more than seven years. The core prices decline was partly due to a one-off, structural 7% decline in wireless telephone services. Additionally, used car prices declined 0.9%, reflecting a flood of off-lease vehicle supply in the market. There were also some obvious weather effects last month. Hotel room costs declined by 2.4% and clothing prices fell by 0.7%. Elsewhere, headline retail sales fell 0.2% last month. 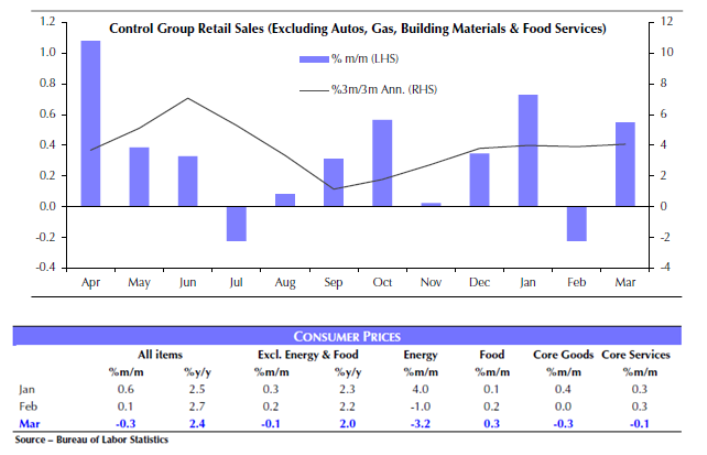 But as Chart 1 shows, excluding autos, gas and building materials, the so-called “control group retail sales” actually increased by a healthy 0.5% in March, but February's 0.1% gain was revised to a 0.2% contraction. This suggests real consumption barely increased over the first quarter. Before panic sets in, however, it’s worth stressing that the three-month-on-three-month annualized growth rate of control group sales hit an eight-month high of 4.1% in March. Therefore, the death of the U.S. consumer is much exaggerated.